In the course of his career, Mr. Volcker worked in the United States Federal Government for almost 30 years, culminating in two terms as Chairman of the Board of Governors of the Federal Reserve System from 1979-1987, a critical period which saw an end to several years of high inflation. 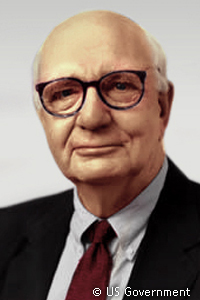 In the earlier stages of his career, Mr. Volcker served as Undersecretary of the Treasury for Monetary Affairs during the early 1970s, a period of historic change in international monetary arrangements. He was subsequently President of the Federal Reserve Bank of New York, and in earlier years was an official of The Chase Manhattan Bank. Mr. Volcker retired as Chairman of Wolfensohn & Co. upon the merger of that firm with Bankers Trust. From 1996-1999, Mr. Volcker headed The Independent Committee of Eminent Persons, formed by Swiss and Jewish organizations to investigate deposit accounts and other assets in Swiss banks of victims of Nazi persecution and to arrange for their disposition. From 2000 to 2005 Mr. Volcker served as Chairman of the Board of Trustees of the newly formed International Accounting Standards Committee overseeing a renewed effort to develop consistent, high-quality accounting standards acceptable in all countries. Upon leaving public service in 1987, and again in 2003, he headed private, non-partisan commissions on public service, each recommending a sweeping overhaul of the organization and personnel practices of the US federal government. In 2004, Mr. Volcker was asked by UN Secretary General Kofi Annan to chair the independent inquiry into the United Nations Oil-for-Food Program, resulting in the identification of substantial corruption and malfeasance. In 2007, Mr. Volcker was asked by the president of the World Bank Robert Zoellick to chair a panel of experts to review the operations of the Department of Institutional Integrity. That effort culminated in a broad reform of the World Bank’s anti-corruption effort. In November 2008, President-elect Obama chose Mr. Volcker to head the President’s Economic Recovery Advisory Board, which he did until 2011. Pursuing his many continuing interests in public policy, Mr. Volcker among his extensive non-profit activities has been former Chairman of the Trilateral Commission and remains Chairman of the Trustees of the Group of 30. Educated at Princeton, Harvard and the London School of Economics, Mr. Volcker is a recipient of honorary doctorates from each of his “alma maters”, as well as a number of other American and foreign universities.